Come and socialize, grab a cup of coffee and impact human rights around the world. Every year around Human Rights Day on December 10, hundreds of thousands of people around the world send a message to someone they've never met. 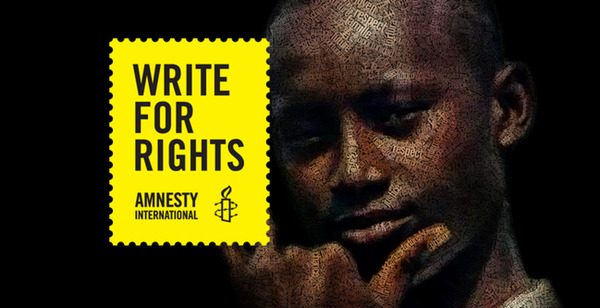 Letter writing has always been at the heart of Amnesty International's work and 53 years of human rights activism shows us that words really do have the power to change lives. Last year, hundreds of thousands of people in 143 countries around the world took a record-breaking 2,373,422 actions. Three of the Prisoners of Conscience featured in Write for Rights 2013 - Yorm Bopha, Vladimir Akimenkov, and Mikhail Kosenko - were released, and nearly all of the Individuals whose cases were featured told us that the burst of activism generated by the campaign helped to inspire and encourage them as they continue to struggle for justice.